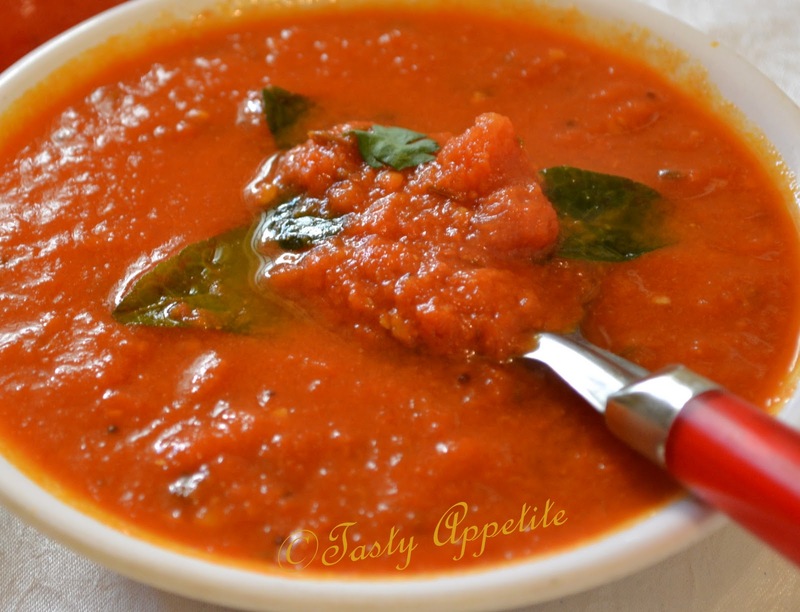 Tomato Chutney is a very tasty recipe, made with fresh tomatoes and spices. My Mother-in-law makes this chutney often, whenever the tomato season is on. This healthy chutney has a sweet-tart flavor with a spicy taste. The tempering of the spices like cumin & curry leaves imparts a irresistible flavor to it. It makes an great accompaniment with Idly, dosa & vada for breakfast. Wash and chop tomatoes to small slices. 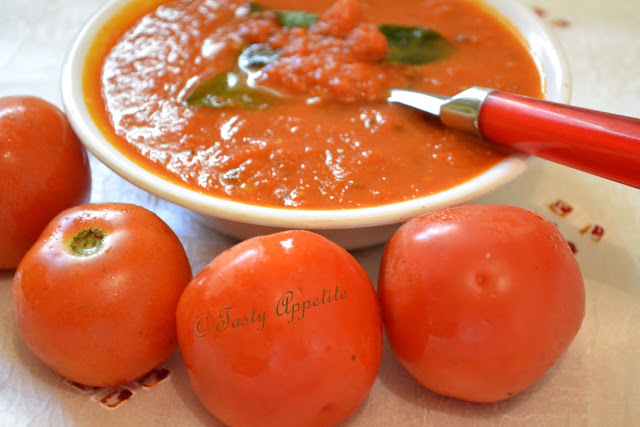 In a blender, smash tomatoes to puree along with garlic. Heat oil in a tawa. 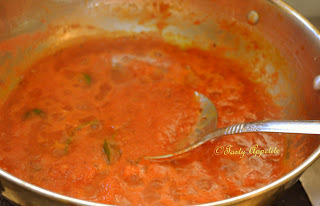 Add the above ground tomato paste. Let it cook on medium flame for 3 to 4 minutes. Check at regular intervals and stir. Add turmeric pwd, red chilly pwd, cumin pwd, salt and coriander pwd. Add half cup of water and let it come to a boil. Reduce heat and cook for another 4 – 5 mins. Lastly, add a pinch of asafetida and turn off heat. Serve with South Indian tiffin items like soft n spongy idlies, golden crisp dosas, kichdi or ven pongal. It can also be served as a dip for fritters. Enhorabuena por el premio, Jay. Este chutney de tomate serviría en mi tierra para acompañar un buen jamón ibérico de bellota. Sé que vosotros no lo coméis, pero es algo espectacular. 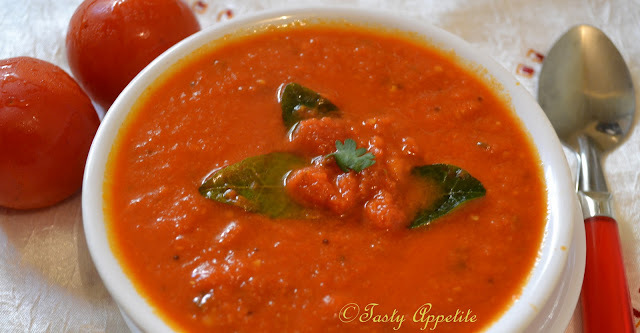 I make tomato chutney many times and have it with chapati and even rice... I just love it. A nice tangy chutney, love the colour in your picture. Thanks for sharing. The color of chutney is divine. and Congratulations for the award. Congrats on your award dear. You deserve it. Looks so presentable and yummy. Tangy and yummy chutney,tempting me a lot..
wow.... yummy tomato chutney... looks delicious jay! Un chutney que je ne connais pas encore et qui me semble délicieux. Chutney looks great & congrats on the award! Congrats on the award. The chutney looks really tempting. that chutney looks tasty but I am such a tomato fan. Tangy sauce ….My family would love this. yummy chutney and Congrats on the award..
chutney looks delicious and perfect color,congrats on your award !! Delicioso o seu molho, perfeito e muito saudável, adorei!!! I really like to try this...once my cousin made a tomato chutney but she used like 3 or 4sp urad dal ,which i think is too much...i think may be urs is good. its a unique recipe...i suppose this is a halal/indian condiment? This looks really good! I once had this at a friend's house and I love it! Thanks for sharing! congrats dear.....chutney looks healthy and perfect. Nice recipe.I love the chutney. Lovely chatni recipe so very colorful perfect for the season! Congrats your blog is truly fabulous! Thanks a lot for passing this wonderful award to me! Colorful presentation! 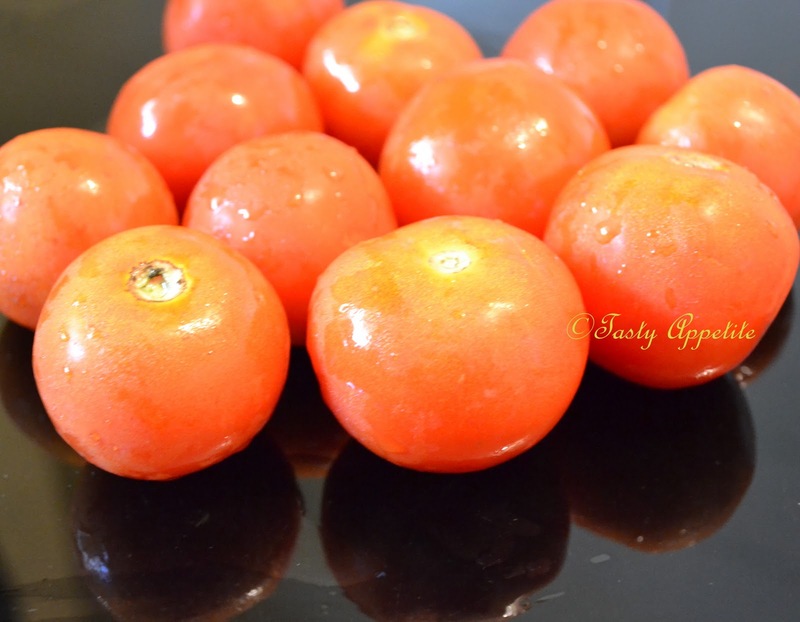 Love the look of the nice glistening red ripe tomatoes. 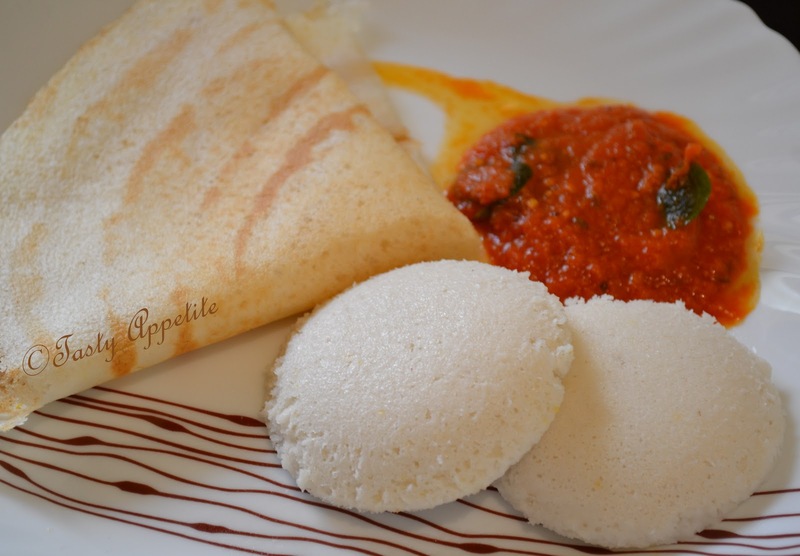 The chutney looks awesome especially with idlis & dosas on the plate. My taste buds just got activated ! Have a great weekend. Incidentally congrats on the well deserved Award. congrats on the awards Jay and simply lovely chutney and yes, we will enjoy it with tosai. Hello Jay, you have always very taste recipe. wow...chutney look awesome dear ...delicious ! thanks for stopping by my blog! have a great time! chutney looks very nice and tasty. Love the color Jay, superb one. Congrats on the award! !you have a great space!! i love chutneys and i love spices, looks like i am bound to try out your tomato chutney soon. Nice spicy chutney, love the bright red color.. I have made tomato chutney many times. But, it was not so tasty or delicious. After that I used your given steps to make the tomato chutney. And congrats for the award.